Since having another "Beer Advent Calendar" would have resulted in many repeats of the same beer reviews, we decided to have a non-day related Christmas and winter beer review celebration. This is a perfect winter brew for sitting by the fire and enjoying the music of the season. The very dark brown beer has a thick tan head that leaves a lacy trail on the sides of the glass. With just a hint of wheat beer flavor, this beer has a taste more like a porter with a light coffee flavor followed by a light, bakers chocolate finish. It is a very good beer indeed! A very dark stout with a brown foamy head that sticks to the glass. A very nice aroma of bakers chocolate and roasted coffee. This wonderful brew starts with a taste of an excellent stout, followed by mellow chocolaty goodness and ends with a bitter finish. This is a beer that brings a nice finish to a grand holiday meal. A wee bit heavy, so save room for it. This bottle was aged for a year and enjoyed at a chilled temp. Dark Horse Brewing Co. & Stone Brewing Co. When friends get together for the holidays, anything can happen and usually does. The patrons of the retroden decided to create our own special collaboration brew from Michigan and California breweries. We mixed 1 part 4 Elf Winter Warmer with 2 parts Bitter Chocolate Oatmeal Stout to create a wonderful Christmas beer experience. The combination of spices and chocolate compliment each other and bring a festive flavor your taste buds will love. This will surely get you into the Christmas spirit! In the cold of winter, Wooly Mammoth recommends a nice thick stout to warm your insides. Berserker definitely delivers with deep, dark brown color that sticks to the side of the mug, and has thin brown, lacy head. The first taste has a traditional coffee like flavor of a stout, followed by a bakers chocolate bitterness. It's a strong yet smooth beer that will warm you up with every sip. Most flavorful served slightly chilled. This is a nicely carbonated brew with a fluffy white head and woodsy, piney aroma. This makes it a perfect choice for the Christmas season. It has a crisp hop flavor and follows up with slight citrus accents and finishes with a pleasant bitterness. A thoroughly enjoyable beer from start to finish that leaves you with a warm, fuzzy feeling for the season. Jubilation ale pours a deep brown color with a quickly dissipating head of winter white snow. With its light candied aroma, the first sip is slightly sweet, followed by hazelnut and finishes slightly peppery and bitter. 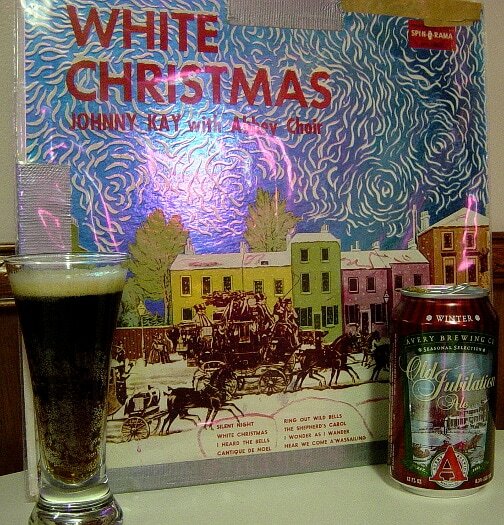 Overall a nice balance of flavors with a malty feel that will keep you in the holiday spirit. Served slightly chilled. This Belgian, wheat style winter brew has a clean, fresh, slightly citrus aroma. The flavor is crisp with a bit of citrus and a hint of cloves. There is a slightly bitter, orange peel finish with the lingering hint of cloves. With it's cloudy appearance and bubbly head, it is not a heavy brew, and won't weigh you down. We think you would enjoy this by the campfire, or while enjoying the solitude of a brisk winter evening! This pitch black stout with a nice tan head has the aroma of coffee, roasted peppers, and dark chocolate. It has a fizzy mouth feel that tickles the tongue with flavors of bakers chocolate, coffee stout, a pinchyness of cinnamon, and a little heat from the peppers. This nice and flavorful beer is best enjoyed at slightly chilled temps, and sipped like a fine brandy. It will warm you from the inside. This winter IPA begins with the scent of citrus. It has a light golden color with a super thick, creamy head. The first taste is crisp and piney from the hops. The finish is lemon citrus sweet to offset the hop bitterness. The heavy carbonation dances the flavor around in your mouth. Enjoy this brew while trimming the tree, or in front of the fireplace listening to some relaxing tunes.